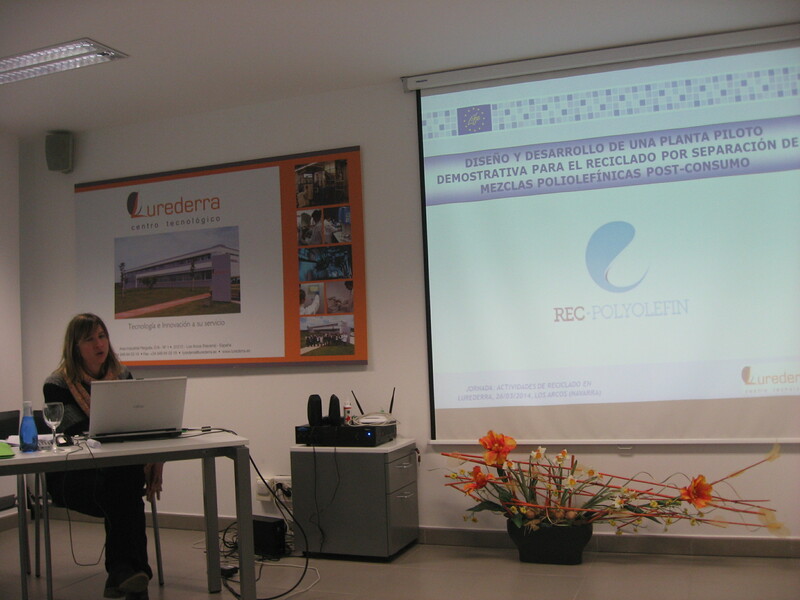 The project REC POLYOLEFIN was carried out for the period between September 2011 and August 2014. 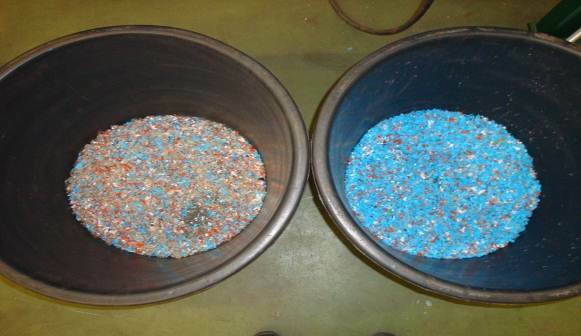 The results obtained during that time were satisfactory, achieving optimal outcomes that have given rise to the design and development of a demonstrative plant for recycling and separation of polyolefins. 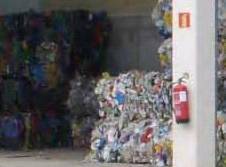 At the start of the project a full study was carried out about the plastic waste collected by different waste management centres in Comunidad Foral de Navarra and in the Netherlands (taking into account the geographical location of the project’s partners). Further to the study conducted in Navarra, it may be said that the percentage of polyolefins in the plastic waste are between 0 and 20 %, according to the origin area. On the other hand, in the Netherlands there is a collection network in charge of the waste management where the plastic waste is sold in batches. Subsequently, many studies and tests were developed to define the requirements that are favourable for the polyolefins. After this study, it was established that the mixture of polyolefins should have a similar size and need long residence time and high temperature, because better results were obtained. 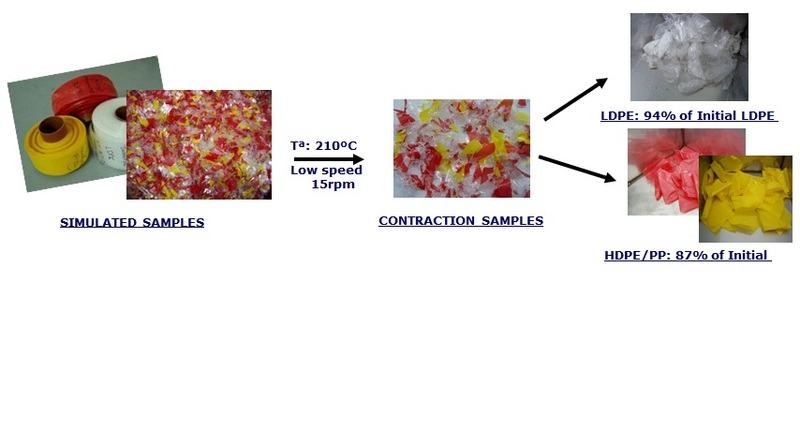 To carry out the tests, batches of simulated samples were used with the following composition: HDPE (red): 18%; PP (yellow): 12%; LDPE (transparent): 70%. 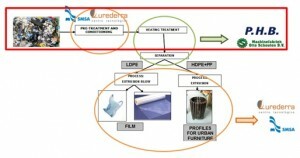 An analysis of the different types of plastic wastes was carried. Furthermore, these wastes were also processed in the conditioning system obtaining interesting results. It was concluded that the most suitable fractions to be used in the project were both the industrial solid waste and the agricultural plastic waste as they were the most homogenous. 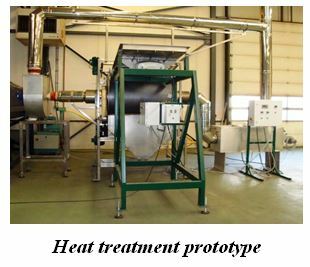 Once the waste to be treated and treatment steps were selected, the heat treatment prototype was designed (rotating drum). This prototype is part of the 1st stage of the separation process. 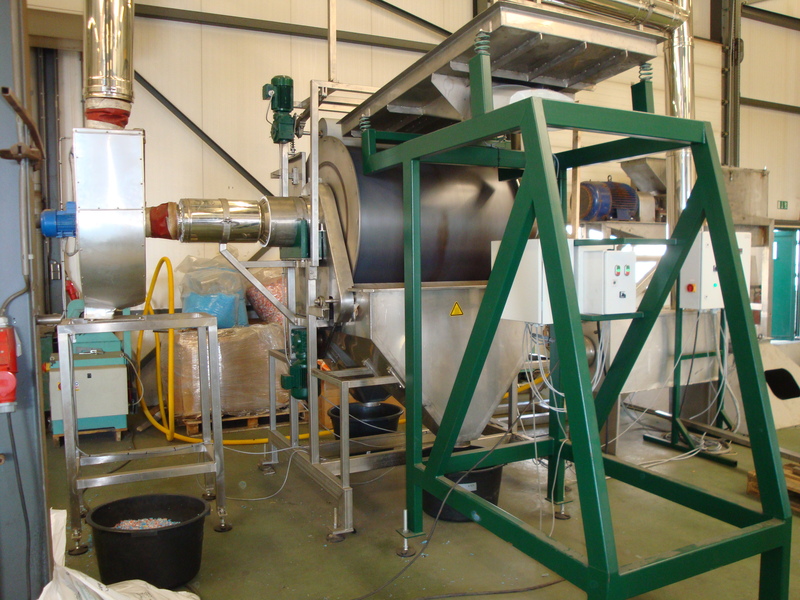 The prototype equipment is able to treat up to 1000 kg/h in order to achieve the optimal thermal contraction of the post-consume polyolefins. When the prototype construction was completed, some tests were carried out with simulated samples in order to optimize the system parameters. During the tests, the system parameters and the materials (temperature, film size, residence time, etc.) were optimized. After the heat treatment, two fractions are obtained, both containing a mixture of all three types of olefins. For this reason, a later separation stage is needed to achieve the objectives pursued in this project. For this purpose, in this second stage, two types of separation were raised: electrostatic separation and pneumatic separation. For the electrostatic separation an in-depth and detailed study was carried out, as well as small-scale tests that showed that the separation of the films by this technique was not suitable. To design and define the pneumatic system, tests were conducted in separation equipment (owned by the partners) with the simulated samples obtained after the rotating drum. After doing these tests, the pneumatic system was designed on the basis of the defined parameters and technical requirements (supply, surface, etc.). Subsequently, it was built. Once tuned up, some tests were carried out to define the working conditions of the process and to verify the correct functioning of the equipment. The two fractions obtained after thermal processing (deformed and non-deformed) were used for the tests. Further tests were carried out to optimize parameters. Once the working conditions were optimized, it was concluded that the pneumatic separation system was optimal and very effective, having high separation performances using different batches. 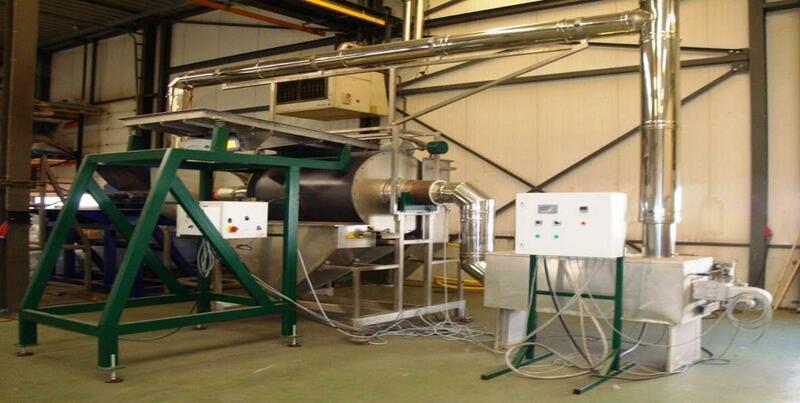 After the optimization of the equipment, further tests were carried out to start up this demonstrative plant. 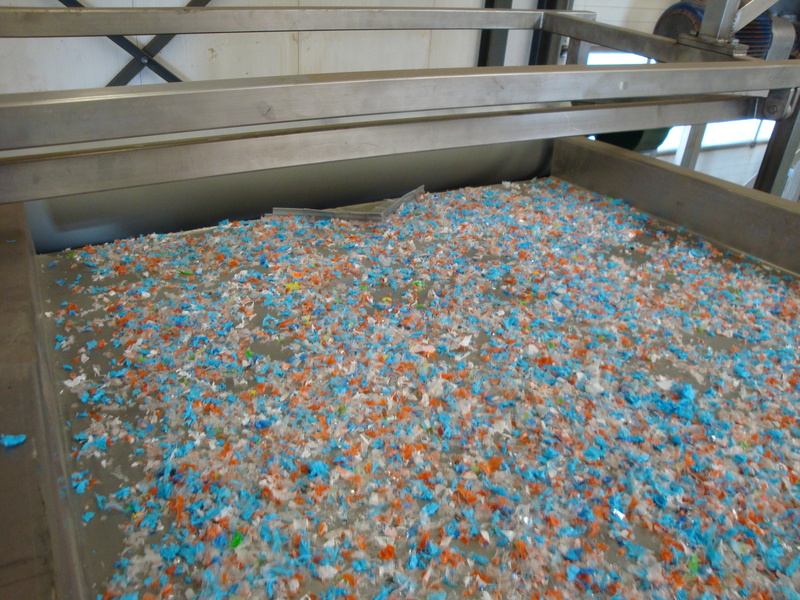 Mixtures of post-consumer polyolefins were collected from different sources. They were grinded and then, treated in the 1st stage (heat treatment) and the 2nd stage (pneumatic separation system). At the 1st stage, the mixture of polyolefins got contracted, obtaining two fractions: deformed polyolefins (low content in PP) and non-deformed polyolefins (high content in PP). 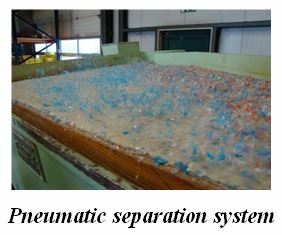 At the 2nd stage (pneumatic separation system), the PEBD was separated from the other materials with no contraction (PP/PEAD). 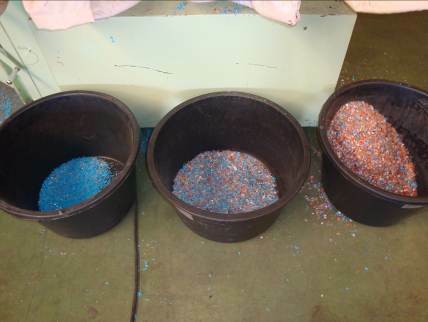 After the tests, different fractions were obtained: fractions containing 95.5 % of PEBD and fractions containing 19 % of PEBD with a mixture of PEAD and PP. After the tests, it was concluded that the successful separation depends mainly on their size, obtaining satisfactory results after the parameters optimization. 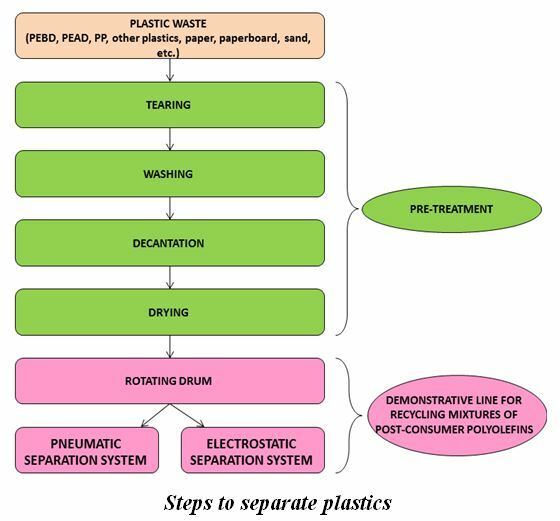 Once the separation process for the recycling of PEBD and mixtures of PEAD/PP was developed, the obtained samples were verified by two methods; on the one hand film extrusion and, on the other hand, profile extrusion. 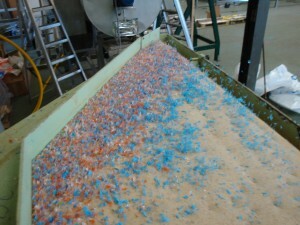 - Profile extrusion for mixtures of recycled PEAD/PP. 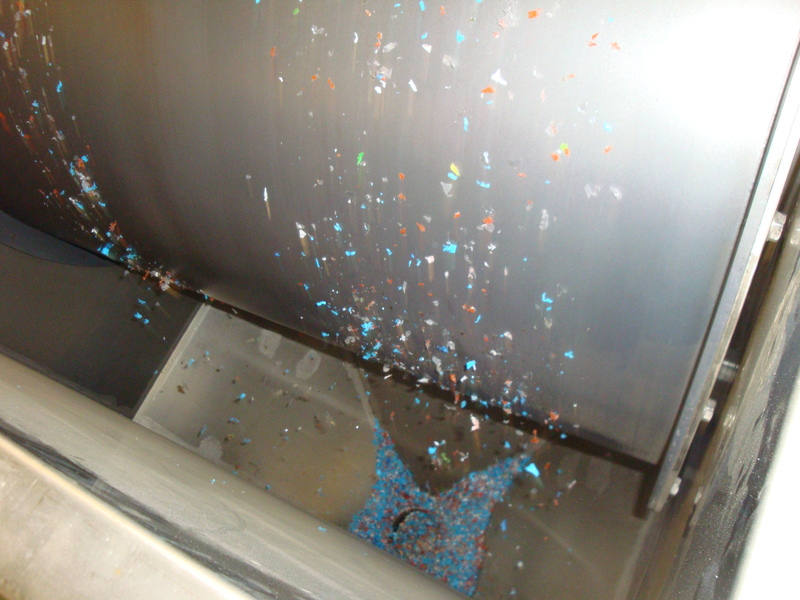 - Film Extrusion-Blowing for recycled PEBD. - Obtaining a demonstration pilot plant for separation polyolefin blends. 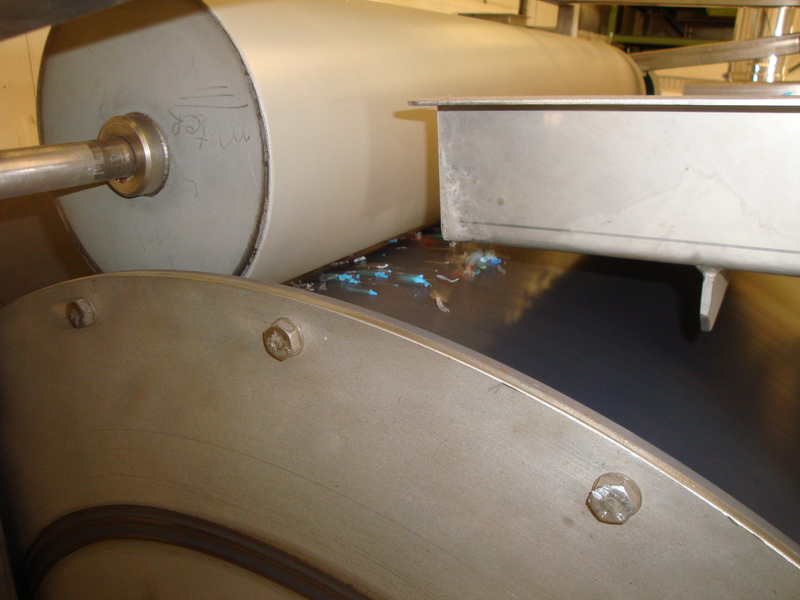 - Optimum polyolefin blends separation for size fractions of 10 mm. - It is necessary a previous treatment with a size mill to achieve the right size for the following process. - Separation in two fractions of the polyolefin blends: a PEBD blend with a efficiency of 97% and the other PEHD/PP blend with an efficiency of 87%. - Definition of the final applications with the obtained products with suitable market results. - Film production with the samples of PEBD with market proprieties. - Profiles PEHD/PP production with market proprieties. 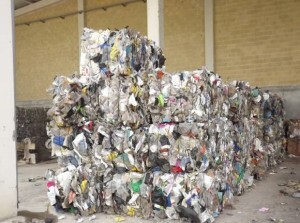 During the implementation of Action 2, which concluded in December 2011, the following activities were successfully performed: study and identification of plastic waste from different waste management and collection centres and definition of technical requirements of polyolefin mixtures to be treated in the recycling pilot plant. Different tests were performed in the prototype drum with capacity of 200 kg/hour and Life Cycle Analysis of recycled LDPE was carried out in order to compare it with virgin LDPE. Action 3 began in January 2012 and was concluded in September 2012. 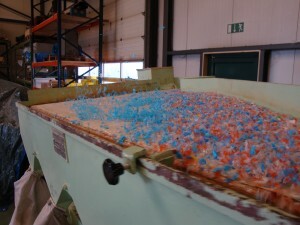 During the development of this action, a comprehensive study, analysis and evaluation of already existing techniques for treatment and conditioning of waste plastics were carried out in order to obtain a material input as homogenous and suitable as possible for the recycling demonstration line. Action 4: Design of thermal treatment prototype – Phase 1. Action 4 ended in August 2013 and objectives set out in the project proposal were successfully achieved. 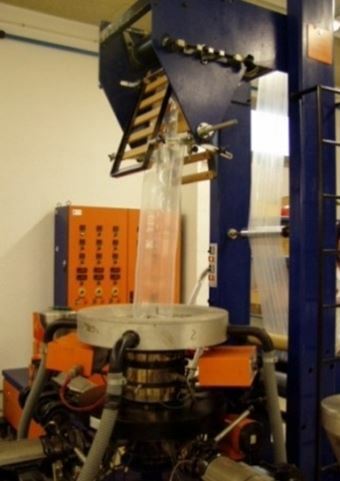 Thus, during the development of this action, prototype equipment for thermal processing was designed and built, whereby the most appropriated thermal contraction of the post-consumer polyolefin mixture was achieved. During Action 5 separation equipment based on pneumatic separation by air flow and on electrostatic separation was designed. After carrying out some small-scale tests the pneumatic separation system was finally chosen. 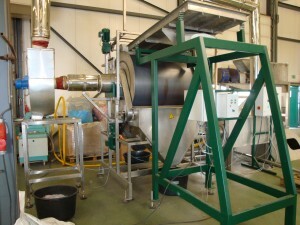 Action 6 consisted of assembling and connecting the different elements in the recycling pilot line and subsequently carried out the corresponding tests by PHB-MOS with the thermal and pneumatic separation equipment, using real samples proceeding from different sources from Lurederra-SMSA. The execution of the action 7 consisted of testing processing recycled polyolefin. On the one hand, Lurederra – SMSA tested extrusion blown with recycled PEBD and on the other hand, it has been tested extrusion profiles with lower value added plastics (HDPE and PP recycling). 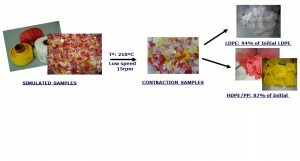 Finally, it has been characterized the obtained products to meet their final properties. 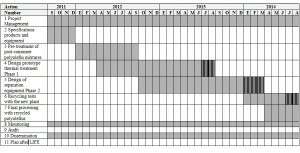 On November, the last report “Final Report” of the project REC-POLYOLEFIN was delivered to the European Commission and to ASTRALE group. The project has a total budget of 1,127,384 €, with an eligible budget of 1.061.684 € and with an European funding of 504.569 €. The 4th follow-up meeting of the Project Rec-Polyolefin was held on the premises of MOS in Giessen (The Netherlands) on April the 9th 2014. Representatives of the Consortium members, Technical and Financial Desk Officers of the European Commission (Santiago Urquijo and Konstantinos Pappas), and the external monitor from Astrale-IDOM (Irune Osés) attended to this meeting. 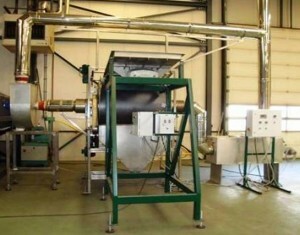 During the meeting technical and financial aspects of the project were reviewed in parallel, and, subsequently, all the assistants visited the facilities of the company MOS, where they could see the thermal contraction prototype to separate polyolefins which was developed during the project (rotary drum heater). 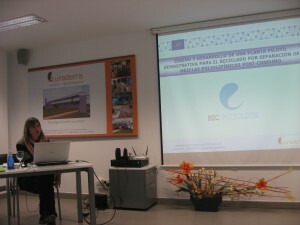 During the session Edurne Osés (Technical R & D, Lurederra Technological Centre) explained a presentation of the developments performed in the REC-POLYOLEFIN project (LIFE10 ENV/ES/000460). 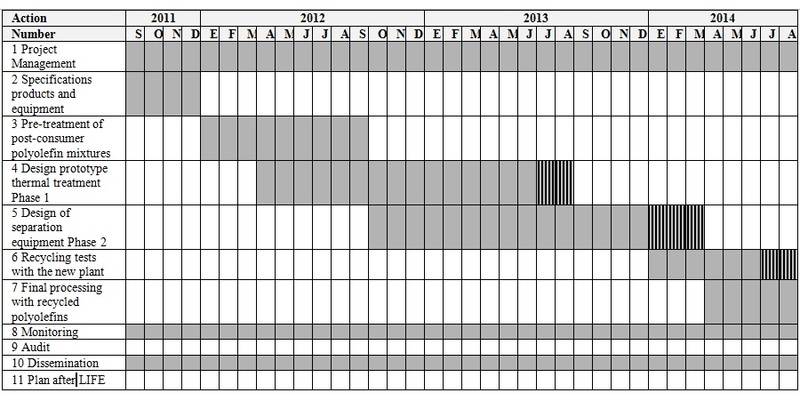 Briefly tasks framed in red in the picture below have been performed so far, while the rest are currently ongoing and are foreseen to be completed on schedule in August 2014. During the implementation of Action 2, which concluded in December 2011, the following activities were successfully performed: study and identification of plastic waste from different waste management and collection centers and definition of technical requirements of polyolefin mixtures to be treated in the recycling pilot plant. Different tests were performed in the prototype drum with capacity of 200 kg/hour and Life Cycle Analysis of recycled LDPE was carried out in order to compare it with virgin LDPE. 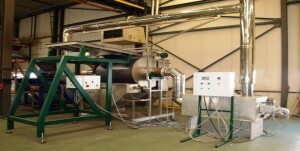 Action 6, which began on January 2014 and is currently ongoing, consists of assembling and connecting the different elements in the recycling pilot line, and subsequently carrying out the corresponding tests with thermal and pneumatic separation equipment. These tests are to be carried out by PHB-MOS by using real samples proceeding from different sources proceeding from Lurederra-SMSA.